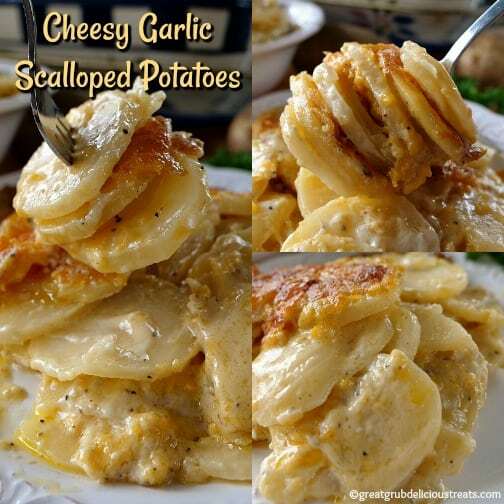 Scalloped potatoes are so good and these cheesy garlic scalloped potatoes are even better. 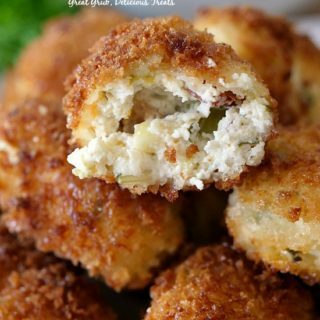 Loaded with three different types of cheese, garlic and sour cream, these are definitely some tasty taters! Totally scrumptious. A delicious potato casserole that’s incredibly satisfying and filling. 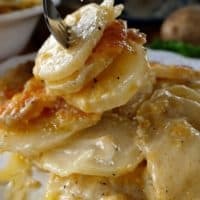 A great side dish, and with the holidays fast approaching, these cheesy garlic scalloped potatoes are perfect to serve with Thanksgiving dinner, Christmas dinner or with any dinner for that matter. 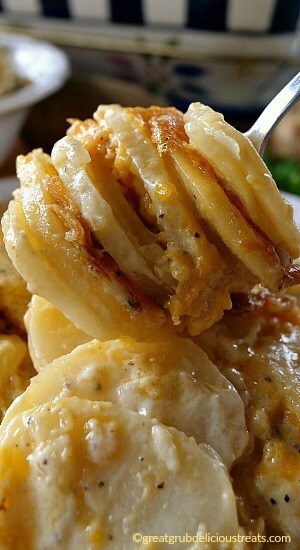 Totally homemade from scratch, these creamy, cheesy potatoes are comfort food at it’s best. 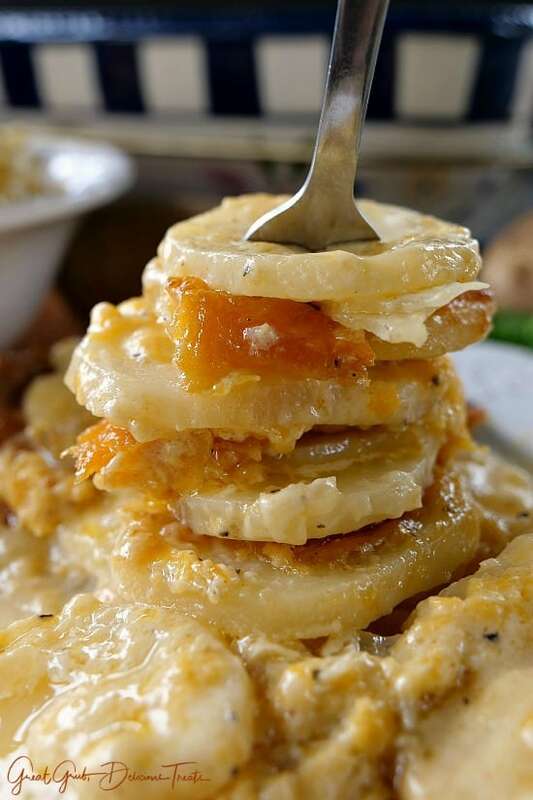 Full of delicious cheesy flavor, and with the crispy crunchy cheese topping, these cheesy garlic scalloped potatoes taste incredible. 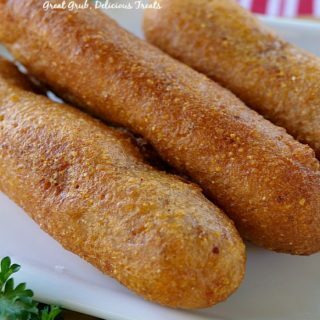 Even the pickiest eaters will enjoy these. 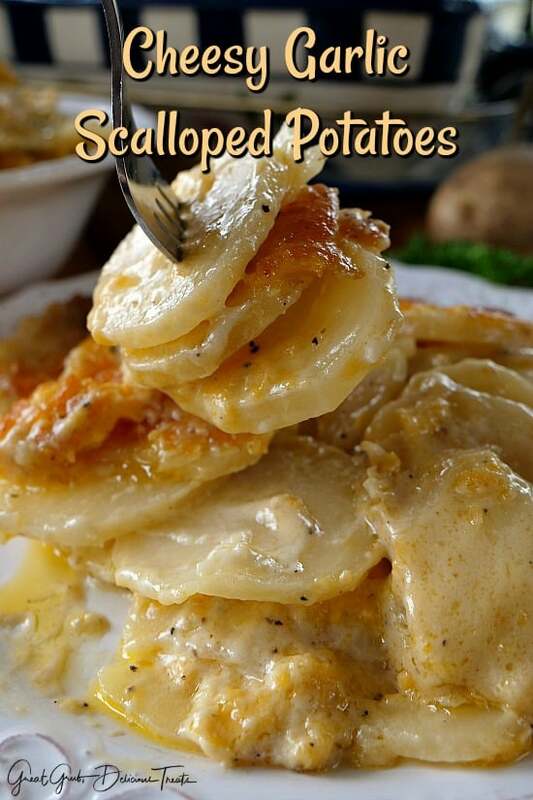 Totally my go-to recipe for scalloped potatoes. 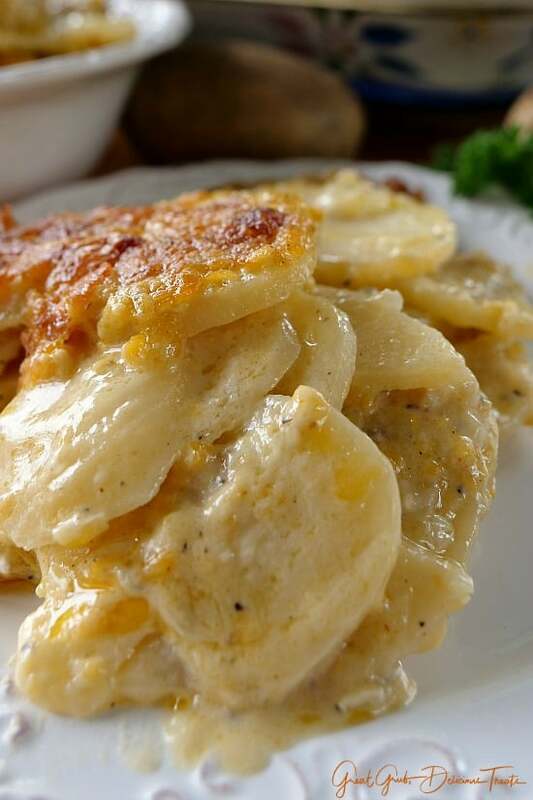 Imagine sinking your teeth into these soft, creamy, cheesy garlic scalloped potatoes. Yum, yum! 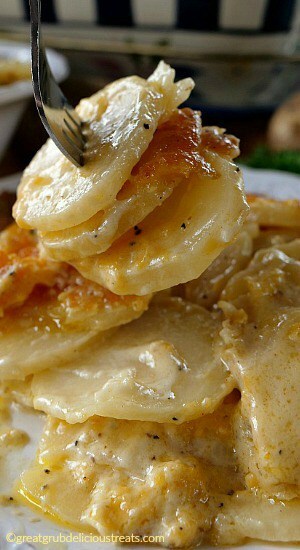 These scalloped potatoes are loaded with creamy, tender potatoes, 3 different cheeses and a cheese sauce to die for. Basically, peel and thinly slice the potatoes. In a large frying pan, melt butter and add onions and garlic. 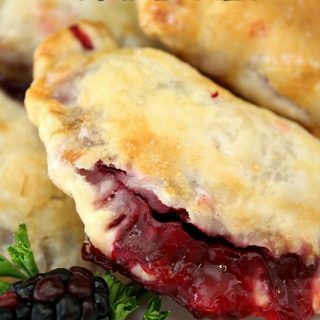 Cook for about 5 minutes, sprinkle with flour and cook for a few minutes longer. Next, pour broth, along with the seasoning, salt and pepper, and heavy cream into onion mixture. Stir until thickened then remove from heat just prior to boiling. Lastly, stir in 2 cups of cheddar cheese. And that’s the cheese sauce. Then, start out by adding 1/3 of the potato slices to the bottom of the baking dish, followed by 1/3 of the sour cream, 1/3 of the cheese sauce and then 1/3 of the Parmesan, pepper jack and cheddar cheese. Once the first layer is complete, repeat two more times ending with cheddar cheese. 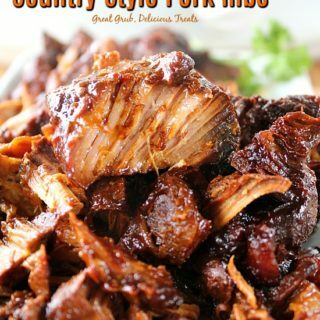 Cover with foil, pop in the oven and cook for 1 1/2 to 2 hours. About 15 minutes before removing from oven, remove the foil and crisp up the cheese a bit. That’s it! 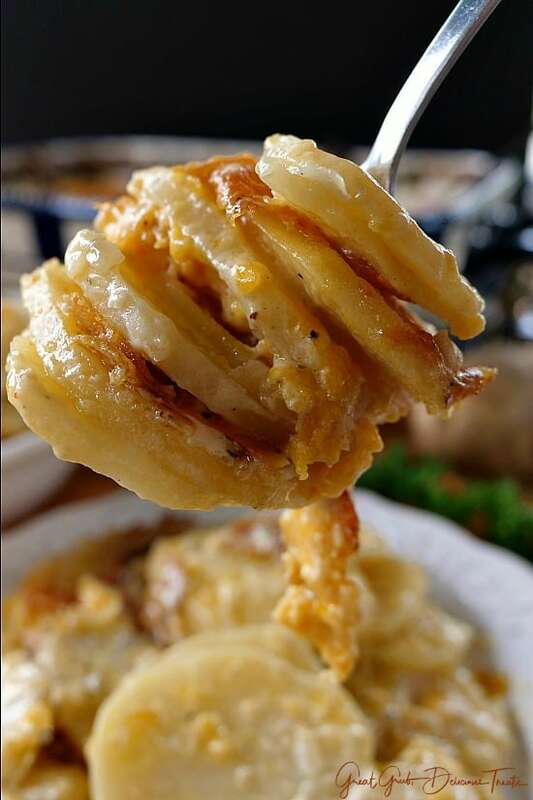 Time to enjoy these tasty cheesy garlic scalloped potatoes. Want a few more cheesy side dishes? My cheesy baked potato casserole, cheesy potato casserole bake, spicy cheesy corn tortilla bake, and broccoli cheddar tater tot casserole are just a few delicious cheesy meals on the blog that you are sure to enjoy. Preheat oven to 400° and spray a 14 x 11½ x 2¼ baking dish with a non stick spray. Set aside. Peel and thinly slice potatoes, approximately 1/8" thick. Place in a large bowl until ready to use. In a large frying pan, melt butter over low flame then add onions and garlic. Saute for about 4-5 minutes. Sprinkle flour over onion mixture, stir and cook for a couple minutes. Gently pour vegetable broth into pan and stir, add salt and pepper, seasoning and heavy cream. Stir until thickened, remove from heat just prior to boiling and then add 2 cups of cheddar cheese. Stir. Layer 1/3 of the potato slices in baking dish then add 1/3 of the sour cream and 1/3 of the cheese sauce over the potatoes. Top with 1/3 of the Parmesan, 1/3 pepper jack cheese and 1/3 of cheddar cheese. Repeat layering 2 more times ending with cheddar cheese. Cover with foil and place in oven. Cook for 1 1/2 - 2 hours. About 15 - 20 minutes prior to potatoes being done, remove foil to brown the cheese a bit. 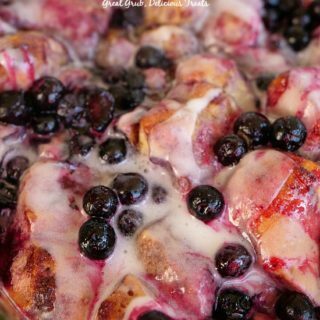 Remove from oven, let sit for about 15 minutes, then enjoy. Cooking time may vary depending on how thin the potatoes are sliced. It’s a Cajun seasoning that can be found at Walmart or the local grocery stores. I’m glad you enjoyed these Alin. Thanks for sharing! What are the ingredients in “slap your mama seasoning”????? Where do I get Slap Ya Mama Seasoning? What is in this or can I substitute it with something else? Hi Mary Jane, Slap Ya Mama is a Cajun seasoning and can be bought at Walmart or the grocery store. We use it all the time. 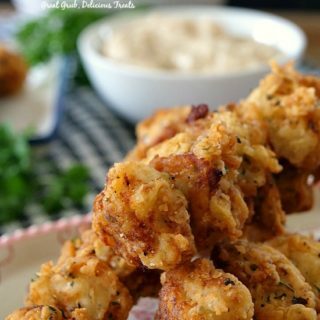 To make your own, you can use salt, cayenne pepper, onion powder, pepper, red pepper flakes, paprika, garlic powder, thyme and oregano.